Answers by Ivar P. after the recording of "Below the Lights"
-Have you somehow changed your songwriting method with "B.t.L."? We've been developing it; in the last 2-3 years we've become more confident with the production too, so this time we were less slow; we simply bring ideas to the rehearsal room, listen to them, break and build them again. "As Fire Swept Clean the Earth" was written just after the "Monumension" release, and the others in the first 5 months of 2002. -Did the techno-thrash riffs of - for ex. - "Queen of Night", which also contains a curious Jethro Tull-like start, come out by chance or do you miss 80's thrash atmosphere? Even if i like that scene, they just came out by chance; Possessed and Voivod are my faves, cos they had intense guitars but the vocals were sometimes boring. -Why didn't you also mix and masterize at the Grieghallen's? We mixed at Jørgen Traeen's Duper Studios in Bergen and mastered at Digipro because they are the best for that; the Digipro were also used for alternative pop productions, while the funny thing about the Duper is that when Jørgen was a student he was an apprentice of Peter Grieghallen and now they're in close connection, so we got the best from their team work. -What does the CD cover represent? Absence of colour. All of the songs are connected by a red line even if there's no concept behind. You can look at them as different episodes; the lyrics are about the Underworld and dark short stories influenced by mythology, but they are not oppressive. -Why did Kronheim and Rep go away? With "Monumension" we approached a lot of different styles and we thought we had to focus and not expand too much, while Kronheim disagreed with us. He wanted a more rock'n'roll direction; we've always reached several compromises inside the band, so we discussed about it and we all felt it was best for him to start his own band. As for Rep, he left the band after the recording of "B.t.L. "; on the contrary, he declared himself unsatisfied and he's started a black metal project to go back to our roots. We wish him good luck. -I found "M." good, experimental and a bit prolix, here I'd say you've returned to the pattern of song adding groove to the epical parts. Do U see any other differences? Yeah, we can say each song here has a stronger identity, we've focused on each, by making one more brutal than the rest, etc. I also think the production is fitter than before. -Where did Arve Isdal play? Did U know him before? We're good old friends and when Kronheim was out we all asked him to join us; he agreed to leave his band, Malignant Eternal, playing industrial metal; the approach went well and he's bringing Kronheim's guitar riffs to a further level. -I imagine your living place has influenced you very much, or you couldn't be so inspired in a city, right? Yes, we live in Bergen, which is, as you know, a big village in a fjord; when I come back from NY, Paris or Copenhagen I have the feeling I was in a big city; being close to mountains helps me be creative; it's nice to wake up and see hills. -Why did you stop using titles in Norwegian? We don't worry much about that; it's true we stopped using them in the last years; the aesthetics is important to some, and it can be better for people having problems with translation from Norwegian; some might bother and not want to translate them or just couldn't. It's like for music: we didn't think if one song'd sound better in English or in Norwegian, it just came out like this. -Your next step will be similar to Manes'? -Though I'm also a fan of electronic music, I don't think so; I could be wrong and stun myself in 5 years but now I don't feel we'll ever become electro-metal; I laugh if I think of us so. We have a certain atmosphere and that style wouldn't give us the suitable one. -Do E. make music for their fans, themselves or both? First we do the music we'd love to hear if we were fans of a band like us. Appreciations are welcome and good because if nobody were interested, we wouldn't have any confirmation of our work. Contemporarily we don't let ourselves influenced by the rumours about our style changes. -Qualities and faults of teh Norwegian scene. Q.: all bands from here play a music that clearly reminds of our homeland, which means all bands are deep-rooted in the scene; we are very idealistic and most bands help each other instead of talking at s.o. 's shoulders. F.: the few bands who are rival and enemies of others and the low quality stuff that comes out just because it has a chance because it hails from Norway. -How do U feel to be pioneers and satisfying old and new fans, critics? (While Satyricon have failed with their latest hard rock album...). 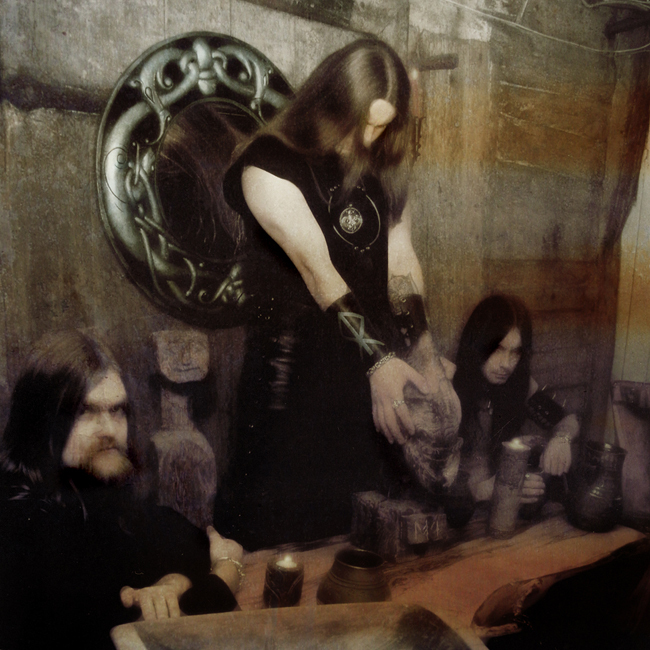 It's interesting how people react; in Norway Satyricon are well acclaimed now too; it's impossible to satisfy all: there are always die-hard fans listening only to the raw black metal albums, like our first miniCD, but i think it's cool to have different audiences. After "Rebel Extravaganza" Satyricon had a huge response and pressure from the media, and not only the metal ones They were quickly pushed from the underground to the overground and they've become a radio band, but I think they are a special case. -Will your live activity be supported by strong lights and particular effects or is it still too expensive for you to set up an adequate show? We're working on that; visuals is important to complete a show; we'll use paints and images, but we won't get to project a film back. -Are you bored to stay on tour for months; has it become a routine for you? I can tell you it's more difficult for me now than in the beginning when I was a single; when I come back home my girlfriend is always pissed off in consequence of waiting. I still like to tour as I'm curious to observe the reactions of our audiences. -And what do U do when U're off tour and out of a studio? I work a little bit, not too much; I wanna keep it at a minimum level; I work for a political association who helps to promote the processes and documents necessary for young bands to get money for their rehearsal rooms, give bands info about taxes, etc. It's good that the resources that music creates come back to the starting point. I also work for the "A Hole in the Sky" festival, but I don't get any money. -What are E.'s next plans? We'll put out a short movie with 2 songs and of course we'll be on the road to promote "B.t.L.". We've also started working on a concept for the new album but now I want to recommend your fans to check out our current CD. (Some Norwegian words followed but I couldn't get them, sorry/Note of M.G.). Bye! After returning from the UK in March last year (02) we all realized that R. Kronheims days in the band had come to an end. Extremely unhealthy and unsociable habits combined with strong personalities and different musical tastes on both sides made it impossible to continue. But hey! That didn't stop us, and with the added force of lead guitarist A. Isdal, we went on to make "Below the Lights". 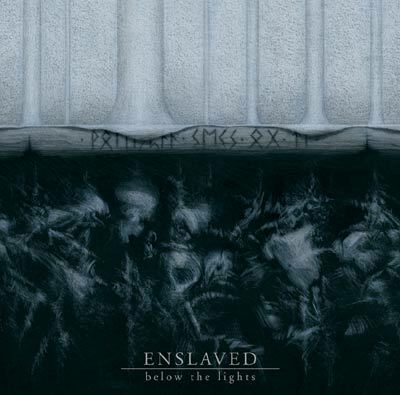 The quality of the arrangements and the level of musicianship should prove that the core of Enslaved more than survived the changes. The coverart is once again under the brush of Truls Espedahl (who also made the artwork for "Monumension"). This time the artwork will follow the music and lyrics even closer, and a surreal, dark and magnificent piece of art will meet you in the shops 12.05.03. After the finishing of the album, Dirge Rep decided to leave the band. The reason is quite simple; he was burned out according to himself. No point in arguing with that. We have a replacement for live and studio sessions in Cato., the drummer some of you might remember from the early days of Red Harvest, Sirius (rip) and new band Re-actor. Ps. Watch out for the live-DVD "Live Retaliation" released through MetalMind Productions. Read about it at our webpage www.enslaved.no.